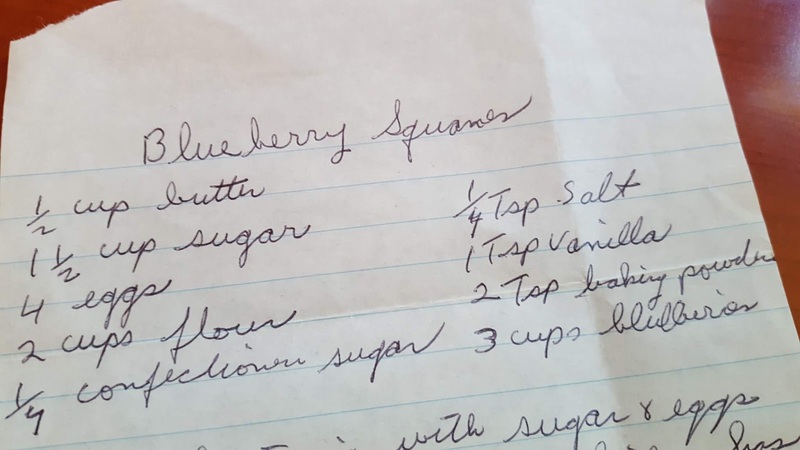 I spent some time going through my Gram's recipe box, and there are so many treasures in there. 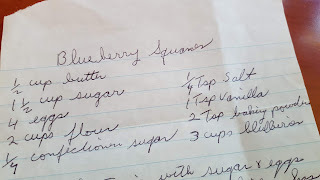 There was a recipe for Blueberry Squares, but there's still a ways to go before blueberries are ready here. When my products arrive from Chef Shamy, one of them was a Strawberry Honey Butter, and my wheels got to turning. 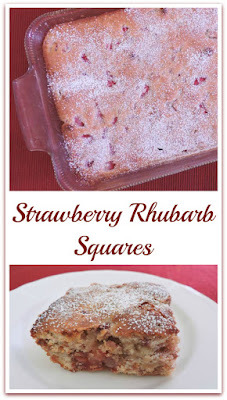 I could use the butter, fresh picked strawberries and why not throw in some rhubarb? I subbed 1/2 cup Strawberry Honey Butter for the regular butter. I ended up using 2 cups diced strawberries and 1 cup sliced rhubarb. The rest of the recipe remained the same. The smell of the squares baking was absolutely amazing. They were perfect with a simple dusting of powdered sugar, but could also be topped with a powdered sugar glaze. This is my last recipe for #CookoutWeek, and I'd like to thank Allison from the PinterTest Kitchen for hosting and to Chef Shamy and all of our amazing sponsors for such a fun event. Don't forget to enter for your chance to win the prize package (worth over $750!) below. If you'd like a rundown on the prizes, go check them out here: Cookout Week prize info. Preheat oven to 350. Grease 13x9 baking dish with the Strawberry Honey Butter. Set aside. Cream together butter and sugar. Add vanilla and eggs. Combine flour, salt, and baking powder in a bowl and whisk to combine. Add slowly to butter mixture. Stir in fruit. Bake for 30 to 35 minutes or until a tester comes out clean. Cool, dust with powdered sugar, and cut into squares. This looks delicious! Your grandmother would be proud. Hand me down recipes are always the best. Agreed! I've already got a half dozen more set aside to try in the upcoming weeks. Thank you! They are one of my favorite fruit combos!